Displaced students sit for school exams at UNMISS. Photo: United Nations Photo. Creative Commons BY-NC-ND 2.0 (cropped). The United Nations decision to shelter 85,000 civilians on its peacekeeping bases in South Sudan during recent fighting saved thousands or even tens of thousands of lives, the UN peacekeeping chief stressed yesterday, citing it as an example of what the world body stands for. “Deaths that don’t occur don’t make news,” Under-Secretary-General for Peacekeeping Operations Hervé Ladsous after a two-day visit to the conflict-torn State, commending the UN Mission in South Sudan (UNMISS) for sheltering the civilians on 10 bases around the country. Thousands of people are believed to have been killed and 825,000 have been driven from their homes since fighting erupted between President Salva Kiir’s forces and those of former deputy president Riek Machar in mid-December. Both sides signed a ceasefire agreement mediated by the regional Intergovernmental Authority on Development (IGAD) in the Ethiopian capital of Addis Ababa last month, and Mr. Ladsous yesterday underscored the importance of adhering to that accord. He stressed that there can be no other solution to the crisis than a political one. “UNMISS is concentrating on three areas: protection of civilians, human rights and help to humanitarian actors to deliver, but clearly the solution to this massive crisis has to be a political one,” he said. He added that his visit to the UNMISS base in Tomping, where he said he saw thousands of people alive was a clear indicator that UNMISS had made the right decision in opening its gates to civilians, even though living conditions were difficult. Mr. Ladsous said UNMISS and humanitarian partners had taken up the most urgent aspects of people’s needs, but with coming rains, it was important to find ways to decongest the bases. “It is a terrible strain for the UN and humanitarian partners to provide water and food but a lot of work is ongoing to improve facilities, find alternatives, but above all to bring about conditions that will help you return to your homes,” he said. Overall the conflict has displaced more than 702,000 people across the country and sent another 123,000 fleeing to neighbouring countries. 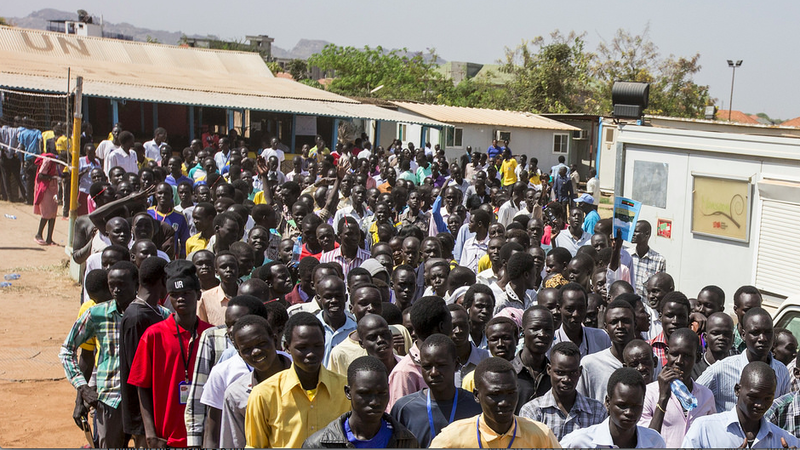 Following the outbreak of fighting, the Security Council authorized a major reinforcement of UNMISS, almost doubling its unformed personnel to nearly 14,000 and ordering in more essential equipment and helicopters but it is taking time to get all the new forces and materiel deployed on the ground. Copyright United Nations News Centre. All rights reserved.